This is for those guys who love castles, knights, siege weapons and anything else medieval. This is what my husband loves, so of course I have been shopping around. 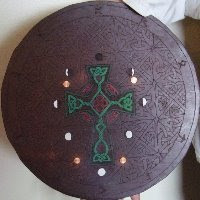 I have created a list of things I found for others who are also looking for medieval gift ideas for Fathers Day. It is nice to find unusual gifts and I like shopping, and I don’t mind sharing what I find. Please note that this is just a list of with the sites and prices I found. I am sure that these or similar items can be found on other website. Working Wood Siege Tower. This is a little siege tower is a1/18th scale replica of a 13th century war engine. It actually shoots a clay ball over 10 feet. It is a kit so it has to be made, but that is half the fun. The kit comes with rolling wheels; lowering drawbridge and firing catapult and includes some modeling clay for projectiles. Requires scissors and white glue. I found this at x-tremegeek for $39.95. 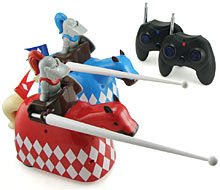 R/C Jousting Knights. This one just made me laugh. Each set comes with two horses, nights and lances. I can see my husband and son having mini jousting tournaments. Each one trying to knock off the others knight from the remote controlled horse. This just looks like to much fun. I found this at Think Geek for $24.99. 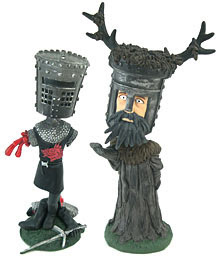 Monty Python Mini Bobble Heads. This will work for anyone who is a Monty Python fan. There is the Black Knight or a Knight of NI to pick from. They are definitely different but fun. I found them at Think Geek for $6.99 each. Wooden War Engine Kits. I found two kits here, one for a catapult and one for a trebuchet. You have to put them together and will need a cutting tool and glue. 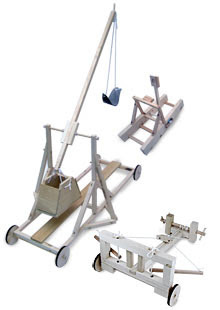 The catapult is perfect for chucking balls of paper and other small objects over cubicle walls. The trebuchet is better for long-range targets. 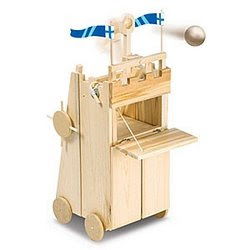 I can just see getting this and the working wood siege tower and end up having a mini war on my hands. I think it would be a lot of fun for everyone. I just don’t think it would just be paper balls being used. Get some of the guys together and I don’t want to think what they will send flying into the air. These I found at Think Geek for $19.99 up to $34.99. Lifesize Office Warrior Weapons. 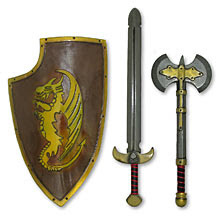 This set has useable (people sized) sword, axe, and shield made of expertly painted foam latex. So they look cool on a wall and you can have fun with them well. Though I think it would be a good idea to get two sets. This does give new meaning to dealing with a conflict at the office though. I know that if I got these they would never make it to a wall. I would actually have to get 4 sets, one for each of us. I already learned that when I got the foam swards from the dollar store. These would get used in my home. I could get some great pictures of my husband having to defend himself from the kids. I found these at Think Geek for $49.99 and $59.99. Handcrafted Leather bracers. 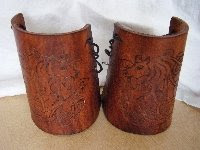 These are very unusual handmade leather bracers with Celtic horse design burned into them. These are art. They would look great displayed, but can actually be put on as part of a costume. Though they can be used for SCA combat. This is at Medieval Magic for $100.00. Celtic War Sword. This is a simple sword that is made of stainless steel and has a leather scabbard. It looks nice, easy to wall mount or have as a costume. This one was nice to look at. However I have to admit that with any sword I would not actually buy one for my husband, as he is very picky about them. He loves to collect them, but he has to pick them. I found this one at Brothers Smith-Sword for $27.95. Functional Great Claymore Sword. Now this is a sword that stands out. It is huge. It would look great on a wall, however the site indicates that it is a functional sword. I think that means that it will take an edge were the Celtic war sword would probably not. This is for the sword connoisseur. I found it at Brothers Smith-Sword for $249.95. I know that if my husband were to pick he would get this one over the smaller Celtic war sword. 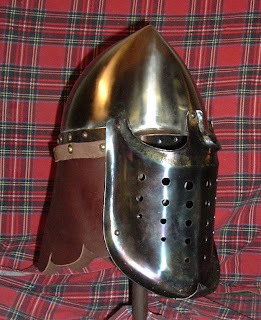 Spangenheim Helmet. 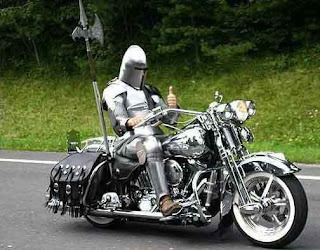 Who does not want a suit of armour? Well that can be very expensive and take up a lot of room. However a knight’s helmet I can fit into my home, and display it. I found some interesting helmets that can be used as a display, or costume, at Brothers Smith-Sword . This one was $79.95. However I found some amazing handcrafted custom helmets at Golden Boar Armoury like this Phygian Style Shovel Face Helm. I could not find out a price because each piece is custom made, so prices will depend on a lot of things.